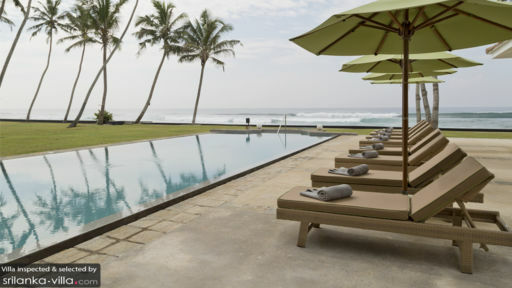 Featuring the eccentricities of a classic Sri Lankan estate, standing just beside the crashing waves of the Indian ocean, is the Tanamera Estate, a holiday haven that inspires island living and relaxed accommodations. With three bedrooms and luxurious amenities that will make you crave for more, the estate is nothing short of breathtaking with its vintage interiors, Dutch-inspired architecture, and sprawling gardens that extend out to meet the palm fringed shores of the ocean. A natural play on colours alongside the mesmerizing cotton candy skies are only a few of the delightful occurrences that one witnesses while staying on the estate. Enjoy a tranquil and serene vacation with friends and family, visit the nearby Galle Fort, and languidly spend your holiday while basking in this tropical retreat! Three well-furnished and air-conditioned bedrooms are hosted at Tanamera Estate, including the opulent master suite furnished with a king-sized bed featuring quality linen and vibrant bedding. Opening out directly to the veranda that overlooks the stunning ocean, the master suite is absolute luxury personified. A spacious dressing area and an en-suite bathroom with a long bath and shower form part of this experience. The other two bedrooms include one that adjoins to the open veranda, and another that leads to the garden out back. Furnished with a king bed and two super single beds, respectively, the bedrooms are equally luxurious and offer a sanctuary to guests where they can retreat and spend some quiet moments. En-suite bathrooms equipped with necessary and modern amenities accompany the bedrooms. Set in a glorious array of blue skies, lush green grass, and the seamless ocean, the infinity swimming pool at Tanamera Estate will soon become your go-to stop for a bout of relaxation as you can lounge on the sunbeds while enjoying the peaceful serenity. Through towering palm trees that are scattered across the lawns, you can get an eyeful of the ocean when you please. The pool pavilion is just off the swimming pool and features an alfresco seating area with white, rattan sofas and bright green cushions. An outdoor dining area also serves as an exciting and uncommon way to enjoy a scrumptious offering of Sri Lankan delights! To ensure the maximum utilisation of the splendid outdoors and nature’s bounty that surrounds and engulfs the estate, the living and dining areas are equipped with floor-to-ceiling wooden-glass doors painted a classic white. The TV room is fitted with comfortable and plush seating, Blu-ray DVD player, a study, and other amenities. The living room is the communal space you’ve always dreamt of, furnished with plush couches, tufted lounge beds, and fluffy armchairs. All the while you can enjoy an unhindered view of the ocean right from the comforts of your seat! Besides the alfresco dining option, the villa houses another formal dining area with a table that can accommodate up to eight guests with ease. To maintain the luxurious ambiance and keep the estate functioning smoothly, there is a concierge and a team of dedicated employees who help to maintain the cleanliness and management of the estate. Additional services like in-house massages, transport, laundry, and private yoga classes can be arranged upon request. 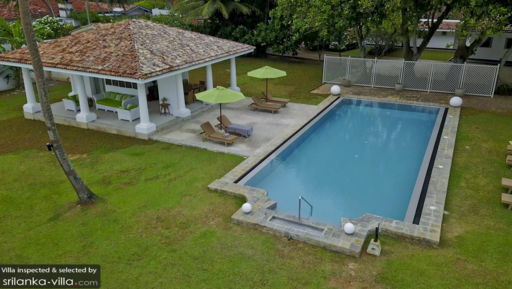 The estate is ideally located as it is quite a bit of distance from the city streets, putting you in a quiet and serene spot near the ocean and yet, the historical city of Galle is only moments away by car. Featuring a UNESCO World Heritage Site, Galle Fort, the city will surprise you at every step. Enjoy watching stilt fisherman, national parks, and other exciting sights in and around the city of Galle! Wow ! This luxuriously sprawling property has an amazing sea frontage - fab situation! The outdoor sitting and dining pavilion allows you to spend many happy hours at the pool without getting burnt. The sumptuous bedrooms oozes comfort and we had the best nights’ sleep. (it was hard to choose between the bedrooms) and there is a further TV / Study room - all beautifully done up with a great selection of DVDs . There is a further cozy dining room in the event of a tropical storm ( which we missed ) . The property is meant for 6 persons but the size allows everyone their own space and also to come together for meals. The staff are gentle and instinctive and nothing is too much trouble. It is the perfect getaway and hideaway without having to be somewhere remote. It is certainly value for money and we cannot wait to be back. We had such a lovely stay at Tanamera. It is classic, very private, stylishly kept for great comfort with breath-taking views of the ocean right in front and never ending waves. The staff were very helpful and kept the place very pristine. A luxurious vacation that lingers on in one’s memory to go back. What an amazing stay at Tanamera Estate !!! THANK YOU Villa-Bali.com !!!! My booking was the perfect combination between the jungle at the front sea at Tanamera Estate..The all team there are doing their best to make your stay a dream come true...After traveling around ASIA during the past 20 years, i have never experienced such an heaven; Fantastic food, great rooms, top services.. and also Wijaya Beach with great snorkeling, Paddy field bike tour, great visit in Galle and a cruise on Kogolla lac are highly recommended. I cannot wait to go back. The wonderful photos of this property can never prepare you for the understated luxury that awaits you. The staff are amazing, so friendly and attentive, they are always there when you need them and never intrusive. Sanath and his team are the best!!! We were looking for a relaxing holiday with friends, the team ensured every minute was memorable and catered for all our needs well above any expectations we had. We were incredibly lucky to meet the owners and hear of their visions for the future and their excitement for Sri Lanka We had such a fabulous time we are booked again for this year and planning another visit in 2016. We were booked into Tanamera Estate for two nights. Four of us had been on a fairly intensive tour of the highlights of Sri Lanka and were in severe need of some chill time - which we certainly received. We arrived after a long drive from the hill country, and were greeted with ice cold lime sodas, exactly what was needed, although I did follow it up with an ice cold Lion beer. The staff were unobtrusive but had the knack of being present whenever we needed anything, sometimes even before we knew we needed it!. The two main bedrooms are huge with enormous beds, and had all that we could require. The food was delicious - Sri Lankan curry and rice on the first night, and a Japanese selection on the second night. The breakfasts served on the verandah were far more than adequate, and also very tasty. We were left alone (apart from the security staff) later in the evening, but were shown where to find the beer and wine. The sound of the ocean lulled us to sleep, and the sea views in the morning are spectacular. The pool is delightful. I guess this must be what it feels like to be royalty and have your every whim catered to. We stayed here for a week. Those used to 5 star hotels will be upset .... With the 5 star hotels. The service was second to none, they literally read our minds and offered food and drinks. The view is incredible and having run up and down the beach I can safely say this it the best villa around by a long way. Whilst the shore is rocky the swimming pool is large so you can swim if you don't feel like going in the ocean. Food wise... Equally amazing... And cheap as we were only charged for the ingredients. In all... This is underpriced and while not cheap it's probably the best value for money around. Giving a tip was actually a pleasure as it was well deserved. *** hopefully the new owner will maintain this property as it is, it is a unique gem. Tanamera Estate is without doubt a place to getaway from it all. 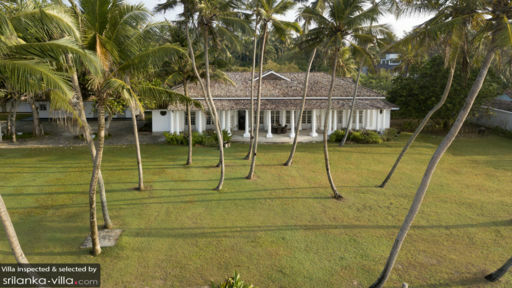 Located 20min from Galle (by tuk tuk) it occupies 2 acres of prime real estate facing the Indian Ocean. Set amongst palm trees (naturally) the colonial style villa takes one back to another time! I can only agree with comments in previous reviews, especially the pool (salt water / 30 ft from the ocean), the staff, the food (you gotta try the ash bananas and fish curries) and the fact it has no tv - really there is no need for one. You won't go wrong with this place. Thx Jack and Sri Lanka in Style!